Apple Co-founder Steve Wozniak says that Windows Mobile Phone interface (he's using Nokia Lumia 900) is more beautiful and intuitive than android or IOS phones. He says that with Lumia 900, it feels like you're with a friend and not with a 'tool'. That's quite a 'comment' from the 'known geek' in the industry. I'd like to ask our fellow CEans their opinion about the Windows mobile interface. Is it better than Android and the iOS? That is indeed quite surprising. I have used windows phones once or twice and found the UI quite responsive. But only a regular user can tell the difference between these three. I used a Samsung Windows phone today , and I should admit - it was awesome. The UI was fast, efficient and quick. Nokia Lumia 900 is winning hearts everywhere and Nokia might just gain the confidence people lost in it. I'd admit that Android is quite boring phone at least in terms of usability and overall appeal. Search ' i got smoked by windows phone', you will find the video. Now I am confused .. which should I go for, Android or Windows 7.5. ...and Gigaom claims that the Windows Metro UI (they're promoting it on their mobile phones as well) will slowly kill Android. Agree or Disagree? ..hmm will google still pay oracle 1B$??? The Windows phone team put a $100 challenge before the people that Windows Phone is simply faster at the everyday stuff they do on their smartphones. They say it is only possible because Windows Phone has Live Tiles that show instant updates right on your Start screen. It is the same as using Mac OS because it lets you access all your applications from the home screen itself. Exactly! Those live tiles excites me the most! I first saw the same video in a workshop by microsoft! And i was very very impressed. 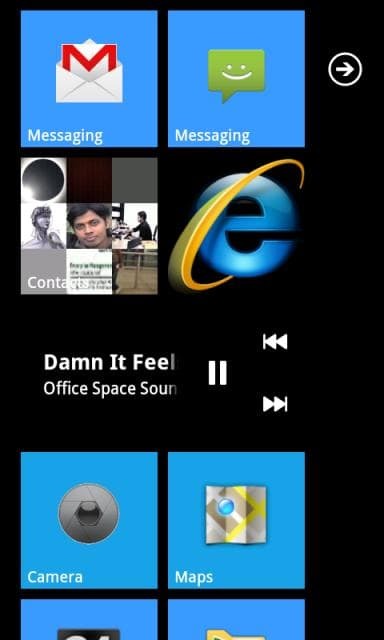 Then when i actually used one of my friends phone i got smoked by windows phone . Its definitly the next big thing and i do agree biggie its metro ui will slowly kill android! I feel that both are for different kind of users. It just feels like a debate on linux and windows. After all android is on linux. Even the OSX is derived from UNIX. Get a android and use Launcher 7 app. It will turn android phone just like Mango OS and its very light. I am using it. these flying tiles looks really awesome. the full version will cost you just INR. 108. The verdict is out. The court did not find Google guilty of stealing Oracle's code or any copyright infringement in the case. Google walks free out of the courts.